Coming off a season in which they claimed their first wooden spoon since 1998, the Brisbane Lions entered 2018 with their finals drought extended to eight years. In Chris Fagan’s second year as head coach, Brisbane endured another tough start to a season, losing their first eight matches, including a shocker in Round 4 against Richmond where the Lions managed just two goals for the afternoon. A landmark 56-point victory over Hawthorn in Round 9 saw Brisbane take a significant step forward in their development, claiming three wins in a row between Rounds 15 and 17, including another shock upset over the Hawks in Tasmania. 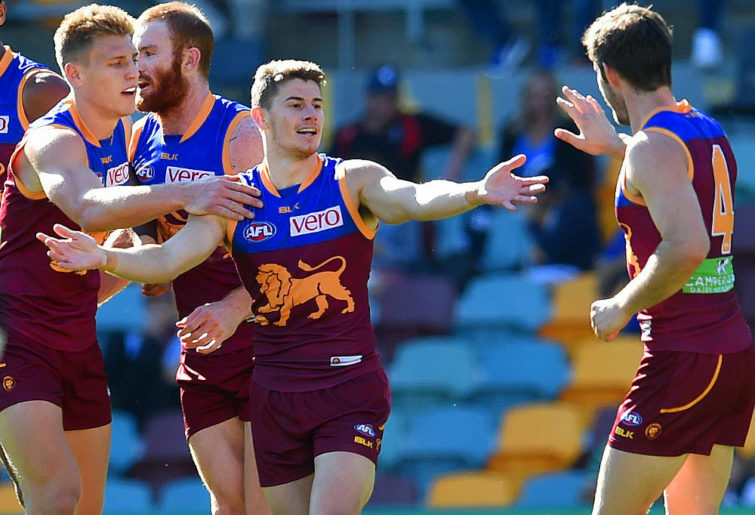 The Lions finished with a 5-17 record, the same as the previous year, but this time Brisbane managed to finish in 15th position on the ladder. Dayne Zorko, who took over the captaincy from Dayne Beams halfway through the season, became just the second Lion in history to win four consecutive best and fairest awards, joining Kevin Murray, who won five consecutively in the 1960s. Zorko won from a vote over Beams, with reliable ruckman Stefan Martin rounding out the top three. The Lions bid farewell to a number of players in 2018, with Irish rookie Cian Hanley retiring on the eve of the season. 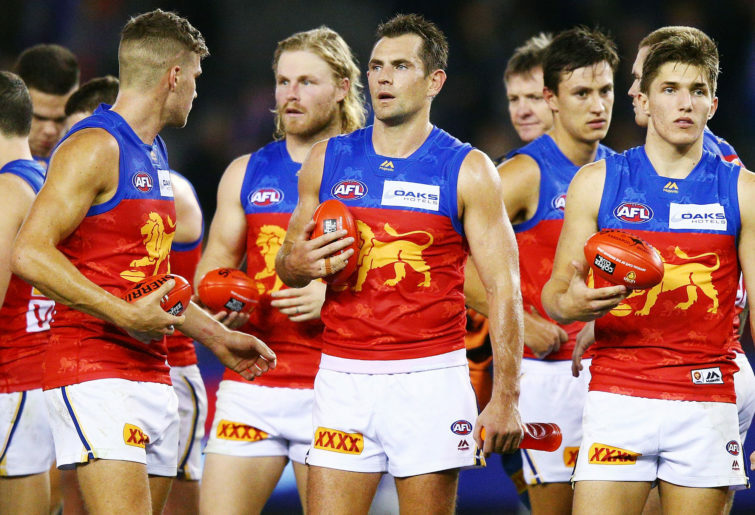 Fringe Lions Rohan Bewick, Tom Bell, Marco Paparone, Liam Dawson, Claye Beams and Jake Barrett were all delisted, while Ryan Bastinac and Jacob Allison were both axed with the promise of being picked back up as rookies. Former Magpie Jack Frost hung up the boots at the end of the season, citing ongoing concussion problems that limited him to just two games for Brisbane. The Lions were one of the biggest players in the trade period after Fremantle star Lachie Neale announced his wish to play for Brisbane. The trading frenzy kicked off with Brisbane landing injury-prone Cat Lincoln McCarthy along with picks 55 and 59, sending selections 43 and 62 back to Geelong. Former first round draft pick Sam Mayes was packaged up with selection five and sent to Port Adelaide, with the Power sending back picks six, 35 and a future third round selection. This allowed the Lions to secure the signature of Neale, giving the Dockers selections six, 19 and 55, getting pick 30 back in the process. Brisbane then boosted their defensive stocks by signing Marcus Adams from the Bulldogs, exchanging pick 32 and a future third round selection. Despite proclaiming his love for the club and his teammates at the best and fairest, former skipper Dayne Beams shocked the footballing world by requesting a trade back to his former club Collingwood. In one of the final trades completed before the deadline, Beams was sent back to Victoria, along with picks 41 and 44, in exchange for selections 18, 56 and Collingwood’s future first round draft pick. The Lions then added ex-Gold Coast midfielder Jarryd Lyons as a delisted free agent, who was surprisingly axed by the Suns at the end of the season. Entering the 2018 national draft at selection 21, Brisbane picked up strong-bodied midfielder Ely Smith from the Murray Bushrangers. At pick 36, Jarrod Berry’s younger brother Tom joined the club, with Tom Joyce from East Fremantle in the WAFL also becoming a Lion at selection 40. Brisbane academy player Connor McFadyen officially joined the club via pick 42, with Oakleigh Chargers’ midfielder Noah Answerth rounding out Brisbane’s involvement in the draft. Along with Bastinac and Allison being selected in the rookie drafts, Irishman James Madden and former NBL player Tom Fullarton joined the club as category B rookies. 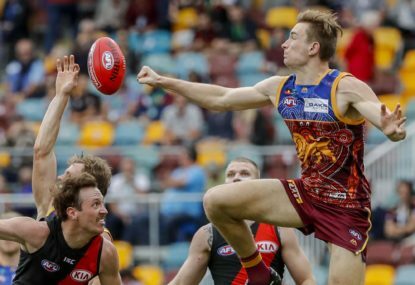 From a speculative pick late in the 2014 national draft, Harris Andrews has developed into one of the competition’s toughest defenders to play on, while he has become a leader of the Brisbane backline. With Dayne Zorko replacing Dayne Beams as captain after the latter stood down from the role, Andrews was upgraded to vice captain of the club. 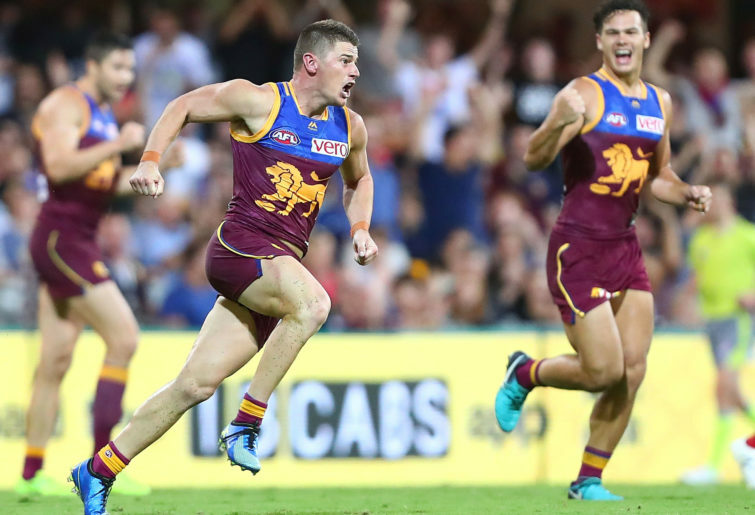 It was the highlight in a mixed year for Andrews, who improved remarkably as the Lions’ general down back, setting an AFL record in Round 10 with an incredible 23 spoils. The lowlight came a month later, when Andrews was knocked out by a crude elbow from Jeremy Cameron, where it was later revealed that Andrews had suffered bleeding on the brain. He would miss four weeks before making his return, slotting straight back in and finishing the year in terrific form. The 22-year-old would poll fifth in Brisbane’s best and fairest and make the All Australian squad of 40. Not bad for a speculative pick late in the 2014 national draft. One of the more versatile players in the competition, Dan McStay’s 2018 campaign saw him move up forward after spending a large majority of the last two years down back in defence. While a great intercept marker in the backline, McStay can find it a little challenging up forward due to his goalkicking action, which leaves a lot to be desired at times. However, the second half of the season saw McStay enjoy more success in front of the big sticks, so Brisbane supporters will be hoping that he has finally turned the corner. With the Lions expected to continue with a three-pronged attack featuring Eric Hipwood, Oscar McInerney and McStay, it is the 23-year-old who could hold the key to Brisbane unlocking their full scoring potential. 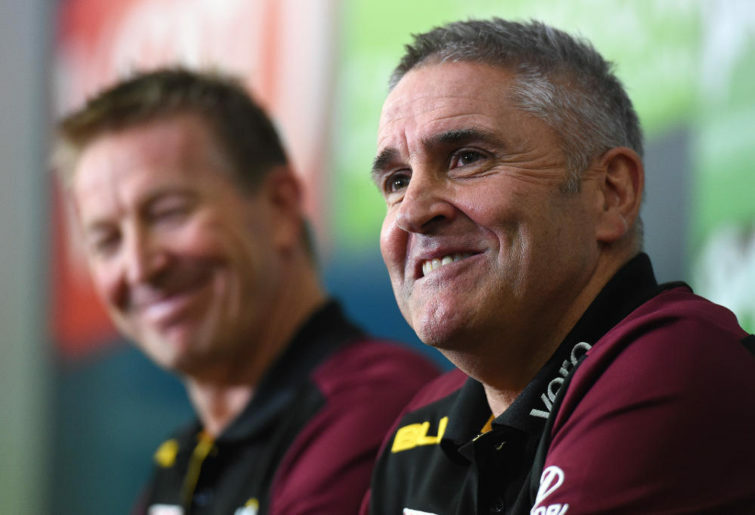 Excitement is building at the Gabba, largely on the back of the performances of the large array of young guns that Chris Fagan has at his disposal. 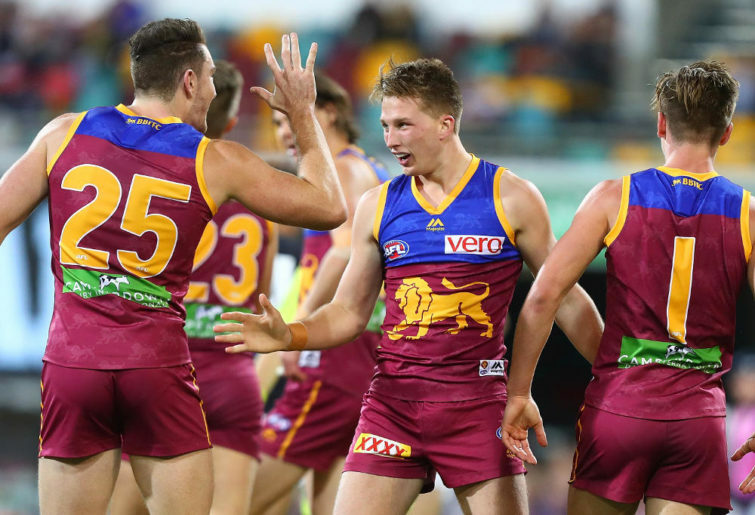 In 2018, it was Hugh McCluggage and Alex Witherden who enjoyed breakout campaigns, both cementing themselves as key components of the Brisbane outfit. In 2019, expect Cam Rayner and Zac Bailey to take the next step. The number one draft pick from the 2017 national draft, Rayner enjoyed a bumper debut season for the Lions, playing every single game and booting 20 goals while averaging 13.5 possessions. Rayner will get more midfield minutes in 2019 as his endurance improves, but look for him to continue being a forward threat. Taken just 14 picks after Rayner, Bailey managed 12 appearances in his first season in the AFL system. With elite speed and skills with ball in hand, the 19-year-old played ten consecutive matches following his debut before returning to the NEAFL. Bailey was recalled in the final fortnight of the season, where he put together a career-best game in Round 23 against eventual premiers West Coast with 20 touches, four marks and two goals. While Rayner will get the most attention heading into year two, opposition clubs and supporters will be foolish to sleep on Bailey. Entering his third year as a Lion with 26 games under his belt, young midfielder Ben Keays had a disappointing season at the AFL level, managing just two matches mid-year. In a good sign, he didn’t drop his bundle, instead dominating in the NEAFL, winning the Neville Fallon Reserves Best and Fairest. With his contract set to expire at the end of 2019, it looms as a make-or-break year. The exact same can be said for former Roo Ryan Bastinac. After a strong 2017 campaign, Bastinac could only muster two senior appearances this year, with his younger teammates flying ahead of him in the pecking order. Like Keays, Bastinac was a strong performer in the reserves, also winning the best and fairest alongside Keays, Claye Beams and Corey Lyons. Demoted to the rookie list, the writing appears to be on the wall for the 161-gamer. After three consecutive seasons of holding a draft selection inside the top three picks, the Lions were forced to wait until pick 21 at this year’s draft, using that selection to pick up tough midfielder Ely Smith. At 187cm and weighing in at 86kg, Smith has a ready-made body for AFL football, capable of breaking tackles and using the ball by hand very effectively. A lifelong Hawthorn supporter, there’s no doubt Luke Hodge will be taking Smith under his wing at training. It wasn’t all too long ago that the Lions were a laughing stock for struggling to keep young talent from walking out the door. It’s a credit to the culture Chris Fagan has created since becoming head coach at the end of 2016, and that turnaround in culture was embodied by Fremantle star Lachie Neale requesting a trade to the Lions at the conclusion of this season. Coming off his second best and fairest award for the Dockers, Neale was involved in one of the more complex deals of the trade period, finally becoming a Lion on the final day. With the loss of Dayne Beams to Collingwood, Neale will fill a huge gap in the Brisbane midfield. It wasn’t the only player Brisbane secured on the final day of trading, with former Dog Marcus Adams sent north to the Lions. A superb defender when fit, Adams has had shocking luck with injury since he was drafted, managing 27 games from a possible 70. With Harris Andrews the key down back for Brisbane, Adams will slot in nicely as a second tall defender and, with better fortune on the injury front, will be hoping to play some consistent football. Speaking of luck, it’s something that has evaded Lincoln McCarthy for much of his professional career. Drafted back in 2011, McCarthy has managed a measly 29 games since his debut, with almost every part of his body failing him at some point. The Lions hope that a fresh start for McCarthy, who was traded from Geelong, will be just the tonic for him to get back onto the park and prove why the Cats persisted with him for so long. Despite his numbers being down on his All Australian year of 2017, Dayne Zorko still managed to claim a fourth Merrett-Murray Medal after a terrific campaign that saw him take over the Brisbane captaincy at the mid-point of the season. At 20.8 disposals, it was Zorko’s lowest possession average since 2013, but he managed a career-high 160 tackles, ranking him fourth in the league. He again had a big influence on the scoreboard, booting 26.18, including back-to-back hauls of four goals in Rounds 7 and 8. Zorko’s ability to find the goals makes him a valuable commodity in Supercoach, where he averaged 95.8 points in 2018. It broke a run of three consecutive seasons where the 29-year-old managed an average over 100 points. As a result, Zorko will enter 2019 cheaper than normal, so it would be silly not to snap him up at a bargain price. A decent fixture for the Lions, although they do start the season with a tough match-up against the reigning premiers West Coast at the Gabba. It will be one of 11 games at their home venue, with three of them to come consecutively late in the season. Brisbane head to Victoria six times, playing three matches under the roof at Marvel Stadium, two at the MCG and one at Mars Stadium in Ballarat. The Lions will head back to Launceston to face the Hawks, making it ten encounters in Tasmania from the last 12 seasons. Brisbane also play one game each in Western Australia, South Australia and New South Wales, while they head down the motorway to take on the Suns early in the season. From their double-up encounters, Brisbane take on state rivals Gold Coast twice, as well as Port Adelaide, North Melbourne and the Western Bulldogs. Hawthorn are the only top eight side that the Lions will play two times in 2019. In Round 4, the Brisbane Lions head to Victoria to take on Essendon at the MCG. It will be Brisbane’s first match-up against the Bombers at the home of football since 2009, and will be just the fifth time the sides have met there. A fortnight later, Brisbane will head to the Gold Coast to face the Suns in the first Q-Clash of the year. The match, scheduled for 1.45pm on a Saturday afternoon, will be the first clash between the two sides played during the day. Then in Round 8, the Lions will make their playing debut at Mars Stadium in Ballarat, making it the 20th venue the Brisbane Lions have played at. After four years without a marquee match on the AFL fixture, the Brisbane Lions have regained the Easter Thursday blockbuster, hosting Collingwood at the Gabba in Round 5. It will be the first time the two clubs have clashed on Easter Thursday since 2004, and with the Pies coming off a Grand Final appearance, it’s a match that looks set to deliver the Gabba its biggest crowd in over nine years. Brisbane will end their season with a daunting trip to Victoria to face Richmond at the MCG in Round 23. The Lions will not only have to overcome a horror 12-game losing streak against the 2017 premiers, they will be looking to arrest a terrible recent record at the MCG. Last year’s 93-point loss to the Tigers at the same venue will certainly be fresh in the memories of the Brisbane players. There is a genuine buzz coming out of Brisbane for the first time in a long time. Having been the laughing stock of the competition for a number of years, the Lions are suddenly not a team to take lightly. With some of the most talented kids on any list in the AFL, Chris Fagan’s team will be one of the most exciting sides to watch in 2019, and a long-awaited return to the finals is definitely not out of the question.